Here we go with part 6. Garnet Lake with Mount Ritter and Banner Peak in the background. The gem lakes. Once you leave Thousand Island Lake and continue south on the John Muir Trail, you will begin to encounter the gem lakes: Emerald, Ruby, and Garnet. There isn’t much on the names in the record, although they certainly are scenic gems and are a pleasure to happen upon. Most likely, all were named by the prospector Tom Agnew, who operated in the area. The first, Emerald, shares its name with another Emerald Lake (just fourteen miles southeast), as well as the Emerald Lakes (also farther south). Next is Ruby Lake, which makes up for its smallish size with the craggy, jagged western shoreline you see as you walk alone the eastern side of the lake. Last, and most impressive, is Garnet Lake. 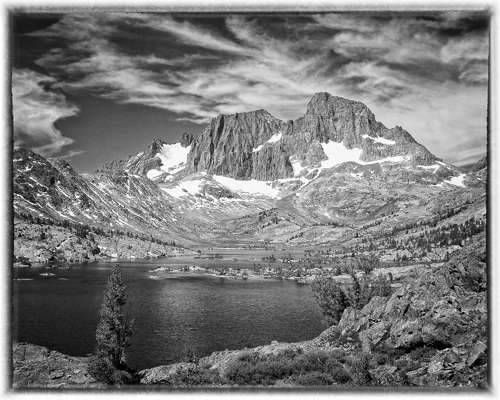 The less famous twin of Thousand Island Lake (which became one of the most recognizable spots in the Sierra Nevada thanks to Ansel Adams), Garnet Lake is the prettier of the two, with Mont Ritter and Banner Peak towering in the background. On a map of 1896, the body of water is called Badger Lake. Mounter Ritter. Mount Ritter was named by Josiah Whitney for the great German geographer, Karl Ritter. Ritter’s dates are 1779 – 1859. Long before Jared Diamond was making a case for geographic determinism in his book “Guns, Germs, and Steel” (and about the same time that Ellsworth Huntington coined the term), Ritter professed that geography has great impact on culture and that the continents had their own physiology, much as a human body does. Anyone interested in his theories should read “Die Erdkunde im Verhältniss zur Natur und zur Geschichte des Menschen” (Geography in Relation to Nature and the History of Mankind). You should probably get started right away; it runs nineteen volumes. I’m told it’s most poetic in the original German. Banner Peak. Banner Peak got its name from USGS map-maker Willard D. Johnson, because of a banner cloud that Johnson observed flowing from one side. Clarice and Laura Lakes. Who these women were is lost to history, the names first appeared on maps in 1953. Altha Lake is nearby, and is possibly named for Altha Branson Summers, the daughter-in-law of Charlie Summers, Sr., who owned a hotel and pack service in Old Mammoth in 1918. Perhaps Clarice and Laura were related to Mr. Summers as well? Shadow Lake. Shadow Lake may have been the original Garnet Lake. The lake now called “Shadow” was labeled “Garnet” on an 1896 map. Confusing the situation even more, Merced Lake was called Shadow Lake. The origin of the name is not known. I’m taking a week off for the Thanksgiving holiday, so we’ll continue at the end of the month. I really liked Ruby Lake, and I wish that I could have stayed nearby. I did spend the night at Garnet, even though it made for a short day. I like being by mountain lakes. Thank you for the research. Happy Thanksgiving.